As the morning proceeded, customer attitudes covered ornery, angry, frustrated, bewildered, and friendly. No matter what was thrown in their direction, the Apple Store employees remained helpful, friendly, and respectful. Even the angry customers calmed down given the response they received from store staff. It was clear from my experience that most of these Apple employees were enjoying their work, and it seemed, each other. On Wednesday morning, I found myself on the frontlines of retail America, with the Christmas shopping season coming down to the wire. My experience was wonderfully positive when it came to the people serving customers. As for the customers, well, that was more of a mixed bag. Let me explain. I spent Tuesday night wrestling with a MacBook laptop that didn’t want to boot up. After trying assorted remedies found online, I called Apple, and spoke with a helpful person from tech support. We walked through a few potential remedies, but still no dice. He suggested I take the computer to an Apple Store. Since CNBC bumped me out a guest spot for Wednesday morning, I had the time to arrive just after the Apple Store in Smith Haven Mall on Long Island opened at 8:00 AM. That was the beginning of a four-hour-plus visit. I didn’t have an appointment, but a staff member worked me in, and my problem was soon being addressed. It turned out my hard drive was fried. A store employee worked a little tech magic, however, and we were at least able to access the files on the machine. Transferring files and photos to a thumb drive took quite a bit of time. 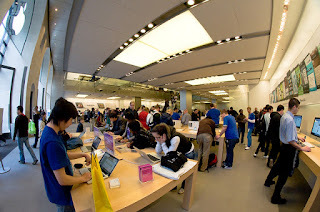 So, I wound up sitting at an Apple Store Genius Bar for some three hours. The length of the visit wasn’t the fault of anyone in the store, but instead on me for not backing up files on a four-year-old computer. As files were being transferred ever so slowly, I was able to get work done on another laptop. But more interestingly, my seat was right in the midst of a retail store experience at the busiest time of the year. For good measure, it was clear from my multi-hour experience that most of these Apple employees were enjoying their work, and it seemed, each other. I heard a few talking about how much they appreciated being able to learn from doing, and others noting that working in the Apple Store beat their previous jobs, including one person who had managed another retail establishment, clearly was not in a managerial position now, but spoke favorably of his new retail experience being more substantive and creative. All of this clearly is a credit to the hiring and training process at least for this particular Apple Store, though my guess is that this likely prevails across their retail outlets. As taught in Management 101, employees are the frontline ambassadors of your business, especially in the retail world. These people were excellent ambassadors for Apple. By the way, it’s also worth mentioning that the majority of these employees were those dreaded Millennials. You know, the group that so many people complain about not having the right work ethic, or simply wasting time in their parents’ basements. But here were Millennials who were engaged, constructive, and helpful. Yes, and they were computer nerds with good social skills – go figure! Perhaps it remains the best policy to judge each person as an individual, rather than as part of some group, especially considering that I know more than a few Baby Boomers who rank as models of laziness and specialists in complaining. In the end, thinking about how times, technology, industries and markets change, it was clear to me that the individuals at this retail store would ably make their way forward in life – some truly excelling – as long as they remained focused on providing quality goods, services and experiences that others need or want, not to mention perhaps having a hand in creating those new products that transform industries and consumer demands. So, those were not four-plus hours wasted on Wednesday morning, but instead, time well spent.